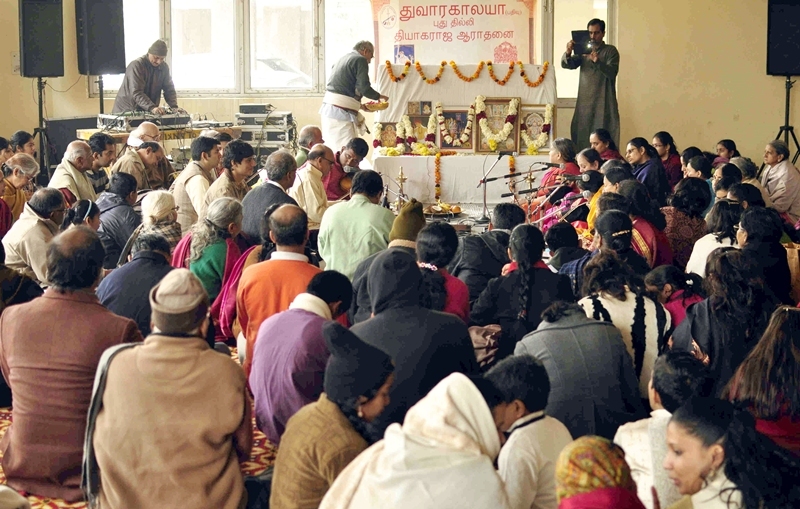 Dwarkalaya had the opportunity of bringing in its First Thyagaraja Aradhana on the 22nd of January 2012 at Dwarka, New Delhi. The Aradhana was performed as a festival whereby it was started with a “Ganapathi Puja “ in the morning followed by 40 children singing various compositions of Saint Thyagaraja. This was followed by the day’s actual process of Aradhana which started with a chanting of Thyagaraja Ashtothram by none other than Delhi’s own music stalwart Dr. K. Vageesh, a top carnatic musician. Followed by award distribution and Certificate to all 40 children. This ended around 2.45 PM followed by “ Prasada Viniyogam “. The hall was nearly full here with more than 300 persons. The following are committee members Jaishankar, Damodaran Hari, M Viswanathan, Santha Kumar of Dwarkalaya. Saint Thyagaraja is a name synonymous with the likes of Lord Rama. He lived during the period 1767 to 1847. Incidentally this was the period which used to be called as the Golden Era for the Carnatic Music World as his compositions rained during this time. Possibly Saint Thyagaraja would have been one of those saints who would &have done his regular talks also through a composition in praise of Lord Rama. The greatness of his composition was it would even drag a novice in music to hum the song; such was the melody. One could feel the Rama Bhakti in each and every song of the saint. For everything he is known to be going to Lord Rama and appeal to him. It is due to this extreme Bhakti that Lord Rama is said to have surrendered to the Saint. Thyagaraja was born in Thiruvarur, known as cultural headquarters in those days, in Tamil Nadu. He was the last of the 3 sons born to Sh. Rama Brahmam ( a great scholar of Vedas, Sastras & Puranas by himself) & Smt. Seethamma ( daughter of Asthana Vidhwan of the Tanjore court in Ta mil Nadu); Saint Thygaraja was named after the presiding deity of Thiruvarur. Infact in one of his compositions “ Seethamma Mayamma, Sri Ramudu Ma Tandri “ – Seetha is my mother and Sri Rama my father, see that coincidence, perhaps singing this with a double meaning. After the birth of Sh. Thyagaraja the family shifted to Thiruvaiyaru near Tanjore in Tamil Nadu. The king of Tanjore gave the family some land here. Thiruvaiyaru is near the banks of river Kaveri known popularly as “ Panchanadi Kshetram “ i.e., the place where 5 rivers meet. The other rivers are Vadavarru, Vennaaru, Vettarru & Kudamurutti. This place has been the abode of various saints, poets & musicians. 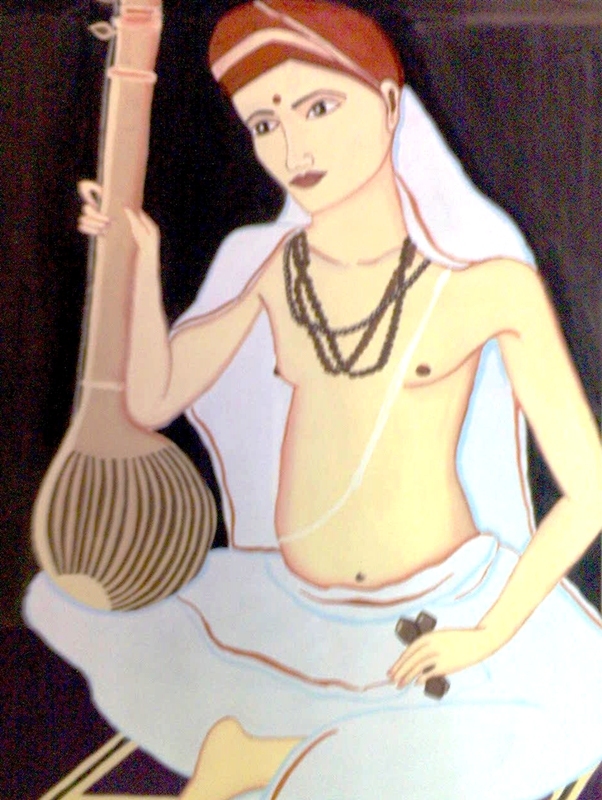 Thyagaraja had his beginning in Music from his own mother and was later introduced to the father of carnatic music Sh. Purandara Dasa at a very early age. Recognizing his talent Thyagaraja’s father requested the then Court Musician Sh. Sonti Venkatramanayya to take him as his student. It was not long when at the age of 17 he started singing small kritis and then graduated into composing music. It was the famous song “ Namo Namo Raghavaya “ which he composed in his teens He got married while he was 18 and at the age of 21 he got spiritual initiation into “ Rama Shadakshari” mantra from Saint Ramakrishnananda. His maiden concert ( popularly known as ARANGETRAM in south) was in the year 1802 at Thiruvaiyyar when he sung his own composition “ Dorakuna Ituvanti “ ( meaning it is possible to get Darshan of Hari ) which is a masterpiece in raga Bilahari. Another composition of his, conveyed his objective “ Nidhi Chala Sukhama “ In this song he says it is only by worshipping Lord Rama that one would attain happiness and not by amassing material wealth. Thyagaraja was believed to have been constantly chanting the Rama Sadakshara Mantra for 21 years. At the completion of 96 crores of Rama Nama, he got the divine vision of Lord Rama at the age of 42. He attained Siddhi on “ the Pushya Bahula Panchami “ in the year 1847 and as per the Hindu Calendar this falls on the 24th of January this year. A brindavan was built in the banks of river kaveri in Thiruvaiyyar, Tamil Nadu. Every year there is a festival to commemorate this great Saint during January when all famous musicians & music lovers gather in Thiruvaiyyar and perform what is known as “ Thyagaraja Aradhanai “ comprising mainly of “ Panchratna Mala “ followed by Divya Namam & Mangala Aarthi. This happened at Thiruvaiyyar, Tamil Nadu on the 13th of January 2012. As a mark of respect Thyagaraja Aradhanai happens in various places throughout India. Delhi is no exception to this where such Aradhana takes place in various places in the 2nd half of January.